Graham Auctions – Industrial, Retail, Automotive, and Real Estate Auctioneers. Welcome to our new website! To view our HiBid portal, you can click "Bid Now!" from the top menu. General Auction information is available below. Graham Auctions conducts vehicle auctions every Saturday, starting at 12:30 pm. We also conduct a monthly unreserved vehicle auction featuring approximately 100 cars and trucks. Every Saturday at 9:00 am, Graham Auctions conducts one of Calgary's largest retail consumer goods auctions. Our miscellaneous auctions contain over 1500 lots with many lots having several items in each lot number. Semi Monthly, - Graham Auctions conducts a Wednesday Industrial and Heavy Equipment auction. This auction contains specialty tools, industry specific tools, construction equipment, large highway trucks and trailers. How did you find out about Graham Auctions? Here is a brief video showing you how to navigate through our Hi-Bid online bidding portal. 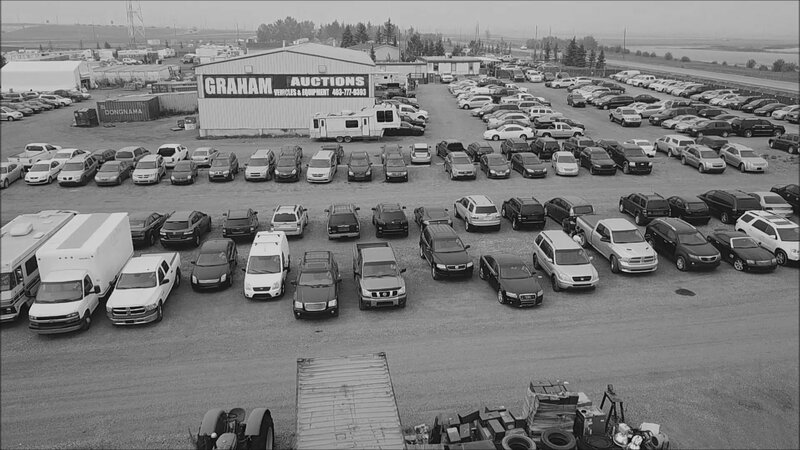 Graham Auction is a household, industrial and automotive auction based in Calgary, Alberta. Graham Auctions was formed in January, 1995 by Larry Graham who founded and sold Regal Auctions in 1989. Since that time we have outgrown our previous location of 7 acres and have relocated to our current facilities that consist of a 31 Acre fenced and secured yard. We have grown to become one of the largest and most diverse independent auction companies in Western Canada and the northwestern United States. We conduct auctions every Saturday at our facilities specializing in Cars, Trucks, Heavy Equipment, Transport Trailers, Boats and RV’s plus handle and remarket approximately 1800 lots of house hold goods, tools, electronics and jewelry as well as return to vendor goods from major retail and wholesale companies as well as inventory liquidations from various companies in Western Canada. Our 8000 square foot heated sales building is capable of operating up to six auction rings at one time. Once a week we conduct a public automobile auction in which we sell for various banks, Civil Enforcement Agencies, New Car Dealerships and general public consignment sales. We also conduct monthly Heavy Equipment & Large Truck Sales for these particular sales we have approximately 200-300 live bidders in attendance and 500 bidders actively bidding online. Graham Auctions has the ability to remarket any types of assets the in Southern Alberta, We have sold everything from production and fabrication equipment to Excavators and Skid Steers and understand cost effectiveness and will do everything necessary to ensure National Leasing is recovering the most value possible on the assets we will be remarketing for you. We feel that for all these reasons, we offer the best service available in the auction industry and will go above and beyond to assist you in the complete process. We are pleased to help in any way possible to sell all types of assets and if you require any further information please feel free to call me anytime. Graham Realty Inc. is a Calgary real estate brokerage with a great team specializing in Residential, Commercial, Rural, Business and Real Estate Auctions. Graham Auctions has a dedicated team specializing in Asset Recovery. This team is provided to help our corporate lending clients in the recovering and remarketing of their product. Trustee, Retirement and Estate Dispersals. Graham Auctions is equipped to handle sales big or small. At our local auction house, or on-site at your commercial location or farm property. I have been a customer of Graham Auctions for the last 20 years. I always appreciate the warm family atmosphere from the staff. Many transactions over the years and have never had a "bump in the road". Great place to shop.